Founded in 1929 as the John S. Barnes Company the hydraulics plant in Rockford, Illinois was built in 1964. It currently has over 275 employees and 125,000 square feet of manufacturing space on a 20 acre campus. Certified to Quality ISO 9001:2015 and Environmental ISO 14001:2015, Rockford manufactures the complete range of Concentric brand hydraulics. During 2010, a total refurbishment was completed, ensuring state of the art facilities and processes based on lean manufacturing principals. This included a completely new plant layout with manufacturing channels, advanced horizontal machining centers and no-fault forward assembly cells. 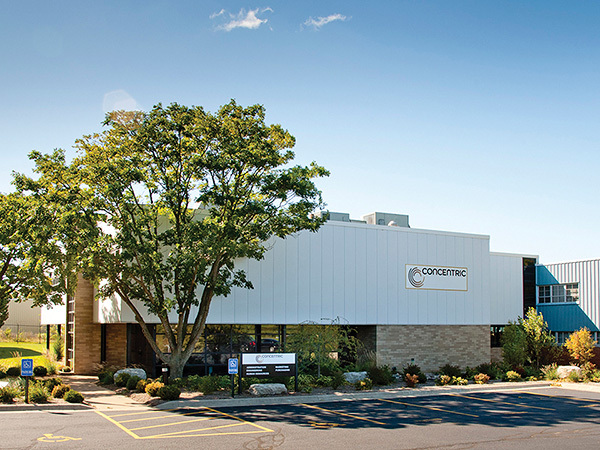 North American marketing, sales, customer service and product service are all located in Rockford. The organization works very closely with its global counterparts to ensure that multinational customers receive seamless support and service for their Concentric-branded products. Concentric Rockford Inc. 2222 15th Street, Rockford, IL 61104, USA.